Blissful Beginnings – a Doubly Blissful Give-Away! Remember Blissful Beginnings: Embroidered Blankets to Cherish? I reviewed this beautiful book of embroidered blankets earlier this month – and now, thanks to Country Bumpkin, I’m giving away two copies! The Really Grand Thing about this give-away is that the book is not quite released to the public yet. That means I’m giving a copy away to two people, before the rest of the world has the book! Just think, you may be one of the first people in the Whole Wide World to clap eyes on this book! This also means that, if you win, you’re guaranteed to have your copy before Christmas. It can be your own coveted Christmas present to add to your own needlework library, or you can give it as a gift! If you’d like to read in detail what’s in the book and see some of the gorgeous projects that you can create with your needle and thread, do take a look at my review. All the details are there for you. The comments are closed for this give-away – thanks for participating! 1. Leave a comment right here on today’s article. Comments sent by e-mail, sent in response to the daily e-mail newsletter, or left on other articles on the website are disregarded. If you have trouble finding the exact comment form, just follow this link and it will take you to the right place. What appeals to you most about Blissful Beginnings? The projects, the idea of embroidering blankets, the instructions for embroidery or constructing blankets, the beauty of the book? What, in other words, makes you say, “I really WANT this book!”? 3. Please make sure you leave a recognizable name either in the “name” line on the comment form or in the comment box itself. 4. Please leave your comment by Wednesday, November 28th, 5:00 am (CST here in Kansas). I’ll draw the winners and announce them on Wednesday morning! That’s it! Pretty easy, eh? Much easier, for example, than battling shopping crowds today! I hope you have a terrific weekend, with a chance to squeeze in some stitching. I’m working on (perhaps finishing!) my silk & goldwork project this weekend, and hopefully working on the Hungarian Redwork Runner in little snatches. That’s the extent of my excitement. Gosh. I know how to have fun! November 28, 2012 Blissful Beginnings – Winners Announced! I love almost everything Country Bumpkin publishes and purchased so many of the book you’ve recommended. I think this book is really something I would love to own and probably would do at least one or two of the projects. The fact that it’s not yet available makes me want it sooooo much more. Hope I’m lucky this time. I love hand embroidery! Don’t have any experience embroideringon blankets. I know your book could teach me some new tricks!! Hola, maravilloso libro, claro me me encantaría tener una copia de tan maravilloso libro, a mi se me haría imposible comprarlo. A mi personalmente me gustan todos tipos de bordados, y este libro tiene variedad. Gracias por su generosidad, espero tener suerte. I make blankets and quilts for babies and would love to add this book to my library for all the inspirations and creative designs it has to offer. The designs are sweet and from the sample pages shown, I see that the instructions are impeccable as I have found in other Country Bumpkin publications. Thank you for reviewing this book and for offering the giveaway. Hand embroidery is so appealing while hubby watches TV so this would be a wonderful book to add to my projects! I would really love one of these books, I have done other kinds of embroidery but never a blanket. My mother made a couple of beautiful embroidered blankets but her eye sight is not good enough to make any more. She has been such an inspiration to me and I would so like go make her a blanket to put over her knees. I would like her to know how much I appreciated all her help and guidance over the years. It would be so nice to be able to give something back to her after all the years she has been making beautiful things for other people. You are my rock mum I love you. Being a beginner at crocheting, this book would become a staple to my library. When I read your article on this book I was instantly delighted. These are such beautiful blankets and will be a joy to make. I’ve entered most of your drawings for books, but have not wanted to win one anymore than I want to win this one. Thank you for making it available. When I first read your post on “Blissful Beginnings”, I surprised at the idea of embroidering on blankets. What a perfect gift, one that will never be duplicated. The lamb featured in “Mary Had a Little Lamb stole my heart and the paisley blanket would make the perfect gift for anyone. I have been looking at blankets in a whole new light! I’m a retired children’s librarian with a guest room decorated in a children’s literature theme. Making something from this book would be perfect! Looking at the photos stirred within me great nostalgic memories of blankets from my mother’s era. Now as a newbie grandmother/nanny/manna – what will he call me? – I want to create such blankets for him and future siblings. And my other child just got engaged! Exciting times. To create new memories and tell new stories. Thanks for the opportunity. I REALLY want this book because I love handwork, and I love baby blankets, and I have a grandbaby hope chest waiting on my sons to get married and bless us with grandbabies. I was diagnosed with cancer a year ago, so it’s important to me to have that hope chest full, just in case. And needlework is my passion, so there is no greater joy than working on that hope chest, and giving gifts to family and friends. The next generation in my family has started having babies, a great incentive to make the adorable blankets in this book. I love to stitch, but am not a designer. Blissful Beginnings definitely solves this problem! Nothing is more fun than creating something for a wee one. I have so many friends that will soon be grandmothers. Love sharing with them the things I make. Always look forward to your daily newsletter. You are such an inspiration to all of us. I have tried things outside my comfort zone after reading about them here. I should also say, that my success has been remarkable. Thank you so much. I love all kinds of needlework. I have just picked up enbroidery again and am incorporating it into other needlework that I do. I would love to have this book to inspire projects I am doing for my granddaughter, and community projects I am involved in. What a beautiful book! These pictures remind me of my childhood. As a cancer patient undergoing cemo therapy, I have found needle projects a nice divergen while sitting for 6 hrs. For the treatment. It would be nice to do some blankets to leave as a legacy for future grandchildren. I love the book for the projects. Crazy quilters find inspiration in many places and this book looks wonderful. It’s all about the hand work. When I was a little girl my great grandma would put empty grain bags, from the Pigeon Grain Elevator Co., on an embroidery hoop. That’s how my sister and I learned to embroider. She washed them up, we would embroider them and we had are very own, hand stitched pillow cases. Reading you every day, reminds me so much of those days. Oh, you should have seen our excitement when we got our first printed piece from the Ben Franklin. Thank you for the memories. The illustrations on stitches and thread seperating are some of the best. Also I especially like the fact that the project appear to be something fairly quick to accomplish. I would love to have this new instruction book. I saw blanket related items at the County bumpkin booth at the EGA seminar in Santa fe. I was intregued then and the possibility of a book whets my appetite even more. I have embroidered blankets since I was a little girl. My godmother taught me my first embroidery stitches on a blanket. The joy of seeing pretty stitches the first thing and last thing every day gives a sense of beauty to every day. I have thought of doing a book myself about embroidered blankets, so will look forward with pleasure to see some of my memories in that book. I love this book! I love the clear instructions and the lovely pictures! The book is just beautiful to look at and the projects are so interesting, you want to make them all! I am expecting a new granddaughter in May. The doctors told her parents they would probably never have a baby and they were heartbroken. Now that she is on the way, I would so love to make a blanket from the book as a special gift for her birth, she is a special gift from God and the answer to many prayers! Thanks! I love the color choices for all their projects; they are exquisite. The detailed instructions and illustrations make all their project do-able! Blankets are for snuggles and warmth. What better way than to have wonderful hand embroidery on them! I would love to have this beautiful book. I can think of a few people to make a special gift from it. Thank you for offering a chance to win it. For them this is a great pass time. I have done other projects with them and have learned along with your e-mails. Thank you for passing on so many great ideas and how to’s. With another grand baby on the way this book would be put to use right away. I am going to spend today and tomorrow at stitch ins with my local guild, then I will really need to do laundry and housework! Bah! Humbug! on the laundry and housework not the stitch ins. This book would be a nice addition to our guild library. Love your blog. Pixie from the Canadian prairies. It has been a number of years since I’ve done much embroidery and this book looks like it would be a fantastic refresher course plus I can already see from your review that it illustrates stitches I’ve not seen done previously. Add to that the fact that there may be a couple more grandbabies in our near future and this is a must-have addition to my quilting/needlework library! Thanks for offering this giveaway! From one of your newest followers (two days now, via SewFrench) who has a lot more exploring to do on your great blog! I would love to own this book for many reasons but mostly to learn more about embroidery , my skills are in need of instruction which is why I love your website,thanks for the chance. I’m still a beginner, but I’m learning quickly. I would love to embroider something that wasn’t just a wall art. And the lamb on the cover had me at first glance! This book looks gorgeous. I have some baby gifts I need to make and these blankets and accessories would be perfect. I really like the idea of making keepsake blankets for new babies. The designs in the book are delightful and include stitches I would like to learn while making blankets. I have handmade blankets made for each of my children which I have saved to be passed on to their babies, and I’d like to be able to provide similar gifts to others. I am new to embroidery but I absolutely love it! I also have a niece due to be born in the beginning of March and another niece/nephew due to be born at the end of April. I am giving both babies handmade gifts from me, crocheted blankets, bibs and toys. I would love to include blankets using some Blissful Beginnings ideas. I would love this book as I can see myself using it for inspiration to quilts incorporating beautiful embroidery, two of my favorite creative hobbies! Thanks for the opportunity to own this lovely book. I would love to win this book. Because, first I fell in love with the lamb as soon as I saw it! I have 2 Granddaughters, and 2 (one boy, one girl) that are like Grandchildren that would love one of the blankets. Second, the clear picutres and instrutions. Thank you for offering this gift. What a delightful book – contains all sorts of great needle works on such a versatile medium – blankets! Isn’t it wonderful to think of wrapping a precious babe in a loving creation from the heart? Your initial review made me keep my eye open for this great giveaway. Thanks for the opportunity to have one of the first. Wauw, de schoonheid van het boek en dat schattige lammetje. En de mooie uitleg van de steken, echt prachtig. Vriendelijke groet, Maria from the Netherlands. I would love a copy of Blissful Beginnings for several reasons. First for the variety of embroidered blanket projects — from whimsical lambs to elegant paisleys. Second, for the detailed (and necessary!) project instructions on how to construct a blanket or a baby block. and Third, for the beautiful pictures and illustrations. It’s not often you find all three components in one book. It’s a Winner! I have seen announcements for this beautiful book in Inspirations. What a Christmas present this would make! I love embroidery especially for children. Have made several things that I have seen in Inspirations. Would love to tackle the blankets. I did purchase “Flowers for Elizabeth” and I am trying to decide to start with something “small” or go for broke and to the whole blanket. What a beautiful piece of art as I know the childrens blankets must be. Am looking forward to seeing the book and hope that I am one of the lucky ones. thanks for the opportunity. Oh, Mary, I am excited you are giving away this book! I saw it on another site and could only dream of owning it. I love! love! love! it; not only for its stitching pleasure, but for its beautiful artistic value as well! It will be a family treasure. Thanks for a chance to have it for myself and my daughters. I would be in true bliss to win it! Enjoy doing designs from this book for my own bevy of grand kids. Thank you for both your review and now this giveaway. I really want this book because I have a granddaughter, just six months old, our first and only. I can see her sleeping under these blankets for many years to come. I love to embroider and quilt, and the patterns are so charming. I hope I win! I own several Country Bumpkin books. They are of the highest quality in instruction and projects. I am an embroiderer (since the age of 7…thanks Mom) and a quilter. What I love about the book is being able to combine my two passions of embroidery and sewing. The projects look gorgeous. Your work is so inspiring and I look forward to your emails every day! Love hand embroidery, and there are many babies in the works in our family. I can’t think of a nicer gift to give than something from this book. Looks lovely! I love this book! I’ve had my eye on it for some time now because it reminds me of my grandmother. She made baby blankets for my children. My daughter’s blanket was embroidered with Mary Had a Little Lamb. My son’s was Little Boy Blue. Both of my children, when they were preparing for the birth of their children, used the blankets as decorations for their nurseries. Those blankets are so precious to us all. I would love to make blankets that would be cherished over generations, and I think “Blissful Beginnings” would be just the ticket to get started. Mary, This is a great giveaway…never had a chance to get a book before it hits the bookshelves! What I like about the book are the projects. I have a friend who does a JOY pillow every year for a Christmas giveaway at our quilt guild. I would love to have the book for the JOY project I saw on one of the pages you posted. Thanks for another great opportunity to win. Receiving this book would be wonderful. I would like it as a picture book, because I have seen the other books Country Bumpkins has published and just like paging through them, as you would a coffee table book. I would do more than look at the pretty pictures though. I bought a piece of fabric meant for a blanket at a Country Bumpkin trunk show a long time ago, and have been looking for a blanket design off an on since then. I bet I could find the perfect design in this new book! Thank you for the opportunity to be one of the first to see and use this book. The beauty of the book, and the idea of embroidering blankets is what appeals to me. Inhad never heard about embroidering blankets before this. I knew abou quilts. Giving an embroidered blanket away you are giving comfort, and telling someone you care for them. Ooooh!!! I WANT this book! I’ve always wanted to create en embroidered blanket and this book has the loveliest patterns. My grandmother embroidered an alphabet quilt for my oldest son when he was born. Sadly, she died before the other two were born and I have no heirloom quilt to give them when their children are born. I would love to be able to do one for each grandchild as a token of love and family continuity. Even if I don’t win this give away, I shall undoubtedly purchase it, or one similar. Thanks for all you share with us, Mary. You are definitely someone I am thankful for. I love anything hand embroidered. I am working on a grandbabies quilt. These blocks would be wonderful for one block. And, I am sure there are more embroidry works that would make up the other wonderful blocks in the quilt with Blissful Beginnings! Thank you. Hi Mary, the Country Bumpkin always have the best books and “Blissfull Beginnings” is no exception. It’s darling. Great blankets for the “wee little ones”. Especially love the lamb. I like that the book takes you in a new direction. The patterns have a new and fresh look. I would be delighted to have this book. Thank you for your give away. Really nice thing for you to do for everyone on your website. All the best. I am fairly new to stitching and this book looks like it was made for ME! The basic step by step directions is exactly what I need. The pictures and direction look like something I could follow. I love everything Country Bumpkin does. How I wish I could visit their store. Winning this book would be the next best thing. Surface embroidery is a favorite technique of mine, and just looking at this book gets my creative juices flowing.Thank you for all you do to further the art of embroidery. So, YOU asked why I want to win this one! When I look at the book it reminds me of quielt and “blissful” times of life. I thought making some of the projects will let me relax! That is what I look for in hand embroidery, projects that have a calming quality to them. Even if I never got to making one of the projects I know I will all look at it and go ahhhhhhhhh! Thank you Mary and Country Bumpkin for doing this giveaway.! For any Grandmother or Grandmother in waiting this is a fantastic book! Creative juices start flowing and dreams form easily because of what it contains. Great for the baby but the designs don’t stop there. Some are applicable for the grandchild who is a toddler or just a little older. How versatile is that? Color photography is great for beginning stitchers and experienced alike. And for those with projects that are lined up (who out there doesn’t have them?) it is a real reference tool and reminder to get stitching! I really want this book because I want to drool over all the pictures! My 5th child – a little girl – is 3 months old and I want to make her a hand embroidered blanket, so she’ll know how special she is to us! Country Bumpkin always has beautiful projects, so I know I’ll find a pretty one ini this book. Thanks for the giveaway. I love reading your blog. Carrie – planenuts! 2) the book ‘starts at the beginning’ … the instructions at the beginning of the book look to be very comprehensive and this would give me courage. I have a lovely excuse to do most of the projects – and don’t you just adore that paisley blanket. I have many magazines from Country Bumpkin, but I think *this* would be the ‘bee’s knees’ for me! I’d cherish it. Regards from Eastern nova Scotia! What’s not to love about this giveaway. I love books and hand embroidery. I would love to wile away hours reading this book. Just the sneak preview you have given us is filled with inspiration and sweetness. I absolutely love the little lambs. Adding this book to my library would be a blessing. Thank you for the opportunity to win. I love embroidered blankets. My grandmother made embroidered doll blankets for me and I have loved embroidery on my bed linenes ever since! We found out on Thanksgiving day that our neice and her husband are expecting their first child in May!Right away I started thinking about a spectacular baby gift and remembered reading your review on Blissful Beginnings. Imagine my surprise when I went to your web site this morning and saw the book give-away. My fingers are crossed that I can soon be working on one of those wonderful designs. not familiar with Country Bumpkin books. but taken with the idea of making an heirloom with little or no patchwork required. the blocks bring back memories to ones that i had when i was small. Thank you for the opportunity to comment. I am starting a stitching group to make items for women and children living in a transitional housing setting and also to help decorate their rooms. It would be wonderful to have the patterns in this book to expand our items to make for them. This looks like a wonderful book with lots of patterns I could use for my “grandbaby” hope chest! By the way, I love your blog! When I take a break from my projects it is one of the few I always go to. I really want to have this book. It has such darling ideas that I could use for my grandson to make HIS special blankets. I love to make things for him…he is so sweet and so far away from me…i miss him terribly. If I am lucky he visits once a year. My son-in-law is servicing his country in the Air Force…tahnk you for your service! I would love to win this book. The lamb stole my heart and would be a perfect excuse to start another project. Thank you! I love embroidery, I love quilts, and I love babies!!!! So how could I not love a book about all three. I love your embroidery, patterns and projects. Keep up the good work. This is a beautiful book! Even if I never made any of the projects, it would still be a great book to have to look through for pleasure and for inspiration. 40 years ago, when close friends or family started having babies, I started to embroider a personalized gift for each baby. Sometimes bibs or burp cloths, sometimes pillows or samplers, occasionally a blanket. Time was the deciding factor. As my kids grew older I had more time and I now embroider a blanket with a scripture for each new baby. I am very excited about this book! Oh what beautiful things I could do!! The creative spark has been ignited. I have a new nephew on the way and and eager to do something before he arrives. This book will let me get started in time to have a unique project ready for him. I enjoy your website, and I hope I finally win. I love to do embroidery and will soon have grandchildren who I would love to make these beautiful keepsake blankets for. I love the detail of the little lamb most of all. I can see the little one’s fingers rubbing the french knots. Thanks Mary! I recently learned that I will become a great grandmother for the first time in May. Wouldn’t a beautiful embroidered blanket make a wonderful gift for the newcomer. Or maybe the blocks with embroidered letters, or embroidered bibs, or………………. Well, I hope I’m one of the lucky recipients but if not I may just have to buy it. It looks like a wonderful book. Thanks. Recently, I have been sewing lap quilts for nursing homes and veterans facilities in our area. I am always looking for new ideas that will help to add some warmth and personal touches for these important people in our lives. I follow your blog and was delighted to read about the new Country Bumpkin book of embroidery blankets! It is exactly what I was looking for. I love the warmth of the colors and the design of Blissful Beginnings. Just the cover is inspiring! Viewing the video shows how well the picture diagrams encourage even the novice embroiderer to try these designs. I am excited to read the book from cover to cover and try the projects! Thank you for sharing this wonderful book. Since I have started reading your blog, I have learned so much about embroidery and have become more confident in sharing my work with others! I would love a copy of ‘Blissful Beginnings’ because all the books I’ve bought that were written by people at Country Bumpkin have been fabulous. The designs are always beautiful and the photography and instructions first-rate. Also, my daughter will be going away to university next September and I have promised I will embroider her a blanket to keep her warm and remind her of home. If I won a copy of the book, I could begin embroidering soon and have a chance of finishing it in time for her to take with her! (I’m not known for my fast work). Would love to win the book, the projects look wonderful, but mostly it’s the instructions I am interested in. Thanks for the chance. So many wonderful ideas! I love making things for my grandbaby, and would love finding more items to make for her. I know this book would be helpful…thanks and god bless. “Blissful Beginnings” would make a great addition to my needlework collecton as I can always count on creative projects from Country Bumpkin. The book will be wonderfully put together with great instructions and colored pages. The book will be first rate! Plus I just found out I’m going to be a grandmother again and would love to make a “Blissful Beginnings” blanket for the new arrival. How very generous of Country Bumpkin and of you, Mary, for this outstanding give-away! I would like to have this book for it’s seer beauty alone. I would love to try my hand at the blankets too though. I find several aspects appealing! The photos look lovely, the directions appear to be very detailed and who could NOT want to embroider a little lamb on a baby blanket!? I’d love this book to embroider for my 1st Grandchild. Since I am the only person left in the family who embroiders, knits, quilts and a little crochet, it is expected that I will be making something. A quilt was requested a long time ago, but this blanket would be a true treasure, I think, and a bit unexpected. My fingers are itching to start sewing. Thanks for the drawing. I like to make blankets to donate, but cannot afford to spend alot on the materials. Spending more time on embroidery is perfect since I can afford the cost of thread. This book would enable me to make more projects and others would benefit 🙂 Your work is so inspirational. Thank you for taking the time to share your work with us. Have a great holiday season ! This book is a winner! The projects combine sewing, embroidery, and applique…three skills I am absolutely over the moon about. And the instructions look clear and clean and to the point. Although my kids are not in the baby making process right now, my grand kids are. Plus we have a wonderful charity in our town which donates “bankies” for babies who have no family. This book would help me on such a project, so I would be delighted to own a copy. Thank you, Mary, for your generosity! 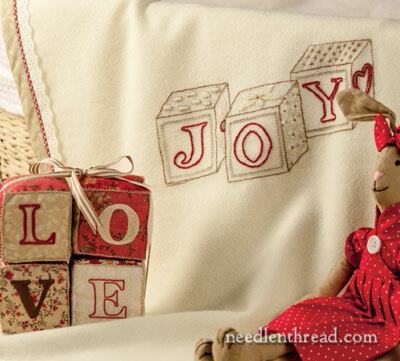 Loved the stitching on the JOY blanket – but the LOVE blocks also caught my eye. Looks like a book with lots of good stuff in it! There a number of new babies in the family. Creating a new blankie for them would be wonderful. I’ve already done quilts and fleece covers. But an embroidery blankie…just so special. Country Bumpkin has such great designs, I’d love to have the book. And, the give-a-way is on my birthday! So, a Christmas present and a birthday present for ME…what joy! There is so much about this book that appeals to me. I like the fact that there are lots of tips, fabric requirements, detailed photos of projects along with ideas for different projects. I think the one thing that would be most useful to me is the part on how to finish the blankets. I would love to have a copy of the book. Would be a great addition to have in my needlework library. I love the projects, would dearly love to do several of them. The instructions are really good also, so that is a bonus. It’s a great book to add one’s collection. I love doing Crazy Quilts and I think the book can give me ideas, inspiration and knowledge in which to make myself even better. I love ‘real’ books that can do this and there is nothing better than a book in my hand which I can look at. This book looks unique with non-standard samples. A beautiful book. Perfect timing. I can now make a blanket for my first great grandchild. Love the embroidered lamb. I am expecting, and I love the idea of embroidering a blanket for the baby. Thanks for the giveaway! I have a number of Country Bumpkin publications and this book would be a welcome addition to my library. Two of my granddaughters (ages 16 & 13) have been doing needlework since they were four years old. This is something we enjoy doing together and gives me an opportunity to tell them “stories” about my grandmothers who taught me to do embroidery, knitting and crocheting. This book would present an opportunity to do more projects together and expand their appreciation of needlework and to spend quality time together. I love the look of the examples. They remind me of beautiful vintage images. I’m making lots of baby blankets these days and would love to add this to my selection. I have two grand babies on the way. Hi, I loved some of the projects in this book. And the instructions on finishing the blanket would really be helpful. I haven’t seen any of their publications so this just might make me get more of them. Hi! I would LOVE to win this book. I’ve always wanted to learn ribbon flower embroidery and I LOVE the blankets. I’ve made a few quilts in my time, but I think I’d enjoy making an embroidered blanket much more. I’ve always loved doing hand work and the blanket designs are precious. Thank you for the chance, it would definitely be a gift to ME if I won it. Bonjour ce qui me plaît le plus c’est la beauté des broderies et les projets. J’adore broder la broderie tradionnelle. Bravo et merci. I just love these books. I have the second one in the series. I love the motifs they choose for the blankets. I have a new grandaughter 2 months old and I am starting a blanket from the book that I have BUT another one would be lovely. These are blankets to cherish always. Doubly Blissful for me for the next two weeks too, both my daughters are pregnant! One due as we speak, one due in 2 weeks, Wee Willie Winky would run all over their cots. i love making little blankets for the little people who come along in my life. so anxious to see the inside of this book whether or not i am a winner. thanks for including me. What a wonderful way to start teh “giving season”!!! Book looks awesome from your review! Please enter me so I can look at the pretties in person…and maybe make a few for the 10 grandbabies I have! I REALLY WANT THIS BOOK! I’ve been following your website and collecting tips and patterns for about a year now, Mary. I cannot tell you how greatly I value the information I’ve garnered from you. I’m 71 years old and have crocheted for 40 years and done a little quilting. I’m really wanting to do some beautiful embroidery now to leave to my grandchildren and greats and there’s no place better to get beautiful tips and patterns than from your Needle ‘N’ Thread. I’m preferring small projects now that I can do while sitting on my sofa next to my floor lamp. I really hope I win this book. If not, thanks ever so much for everything you give us. I LOVE that this book has wonderful technique hints for the beginner blanket maker, but the end results do not look like beginner projects. I LOVE that one can make additional coordinating projects. I have three grandchildren and I WANT this book so I can make them all warm and cozy blankets for them to enjoy for years to come! I love embroidery and my children are finally producing sweet grandbabies for me to stitch for. These designs look adorable and fun to stitch. I love these sweet embroideries. This wonderful little book appeals to me in many ways. It is beautiful to look at, gives the reader information, new projects, some to do and some to dream about doing. It is a book that needs to be added to our libraries. Mary, you and Country Bunkin are very special to all of us in embroidery land. What a timely chance. I am being presented with a new granddaughter in Feb. I have been deciding between an embroidered blanket or quilt. I have always used kits and never done one “from scratch”. This would be perfect. Thank you so much for hosting this. I have thought about this book every since you wrote the review especially the little lamb that seems to be frolicking across the page. The liveliness of that lamb reminds me of the lambs we used to raise and would make a lovely gift for our unborn grandchild. Perhaps with the book’s help, I too could make such a lamb. This book is so beautiful with so many lovely illustrations. Really it is eye candy! Having said that, these are great projects for baby gifts and such. Now to decide which one for which child . . .
Oh my, “Blissful Beginnings” looks like a lovely book. I’m just beginning my embroidery journey and the instructions look great. I’m also a new Momo with 2 granddaughters just a few months old and I think these designs would be great for little blankets for them. The photos are great. I can’t wait to get this book in my hands. This book looks so charming! I love the sweet designs, and the old-timey feel of them. I would love to adapt them to several projects I have in mind for my tiny little cousins. I am a beginner embroiderer (embroiderist?) and have been looking for some beautiful designs to try out my new skills on. This book looks like a perfect challenge for me. Thanks for sharing it with us! Retired and rediscovering embroidery. From this book I can learn how to make some beautiful blankets and brush up on my embroidery skills as well as make some lovely gifts. The photographs in your review have inspired me to want to make a blanket for my new granddaughter. I haven’t embroidered anything in a while, concentrating on counted work. This book makes my fingers itch to get started, again! For as long as I can remember, I always wanted to do needlework. I would go to garage sales and look at the linen first to find a piece of fine embroidery item. I bought several pieces that I am so proud of, and presented them as gifts to my daughter & three granddaughters. I would be so honored to be chosen to get this book. I would treasure always and pass it on to my daughter and three granddaughters as they too love needlework. Never saw this book before, but it looks absolutlely delightful. Would love to win it. I’m very thankful for all your information. You have a wonderful site. Hi Mary, “The Lamb” is what I am inspired to want to embroider. Thank you, Mary, for the opportunity to win one of the Blissful Beginnings books. I love to snuggle under a blanket in the winter evening as I sit and stitch, so being able to make my own embroidered blankets for myself and family would be wonderful! All the projects look fun and colourful, so they really appeal to me. Well, I know if it’s from Country Bumpkin then I will want it! Their books are always SO beautiful and full of things I want to sew. I’ve made a zillion baby quilts but I’ve never embroidered a blanket…and those pictures sure make me want to try it out. Especially the little lamb! I want to improve my hand embroidery, what else? The projects in Blissful Beginnings look beautiful and that would be reason enough to want to own it. But I am especially inspired because my niece is expecting her first baby (a girl) in April. I think a hand-embroidered quilt from her great aunt would truly be a blissful beginning for my soon-to-be grand niece! Making a blanket for a new little one is a very special way to say welcome. I started doing it in my teens for every shower I went to. I’m always looking for new inspiration. Thank you for the chance at winning this wonderful book. I really WANT this book because I am about to make a woollen coat for my ‘grandson’ who happens to be a Cavalier King Charles Spaniel DOG owned by my daughter! I have always wanted to make him a jacket using wool embroidery and I am hoping this book will have some good ideas. I know books that Country Bumpkin publish are always fantastic and adaptable to the project in hand, so this would be a great addition to my library. I would LOVE to win this book because it is such great eye candy, for the inspiration to get my needle out again, and because I am a doting Grandmother who would love to make something like this for a special little person in my life. I am an avid quilter and am always recruited to make baby blankets. This book would be such a nice touch to finish off my blankets! Thanks for offering such a sweet giveaway! I LOVE this book…Everything produced by Country Bumpkin is so fine. I love the idea of being able to embroider beautiful baby blankets to give as gifts. What a great way to say I love you. I have never seen Country Bumpkin before but loved the hand embroidery projects in here. I would love to have the book to try out some of those projects on crazy quilts. I looked @ the sample pages of this book and absolutely fell in love with it. I was looking @ Canadian websites to see if they will be carrying it and was disappointed that it’s not there. I will be a new Grandma in March and am dreaming of all the projects that I can make for my new grandbaby. I think this book will be a wonderful addition to my “Grandma library”. I have also recently gotten back into hand embroidery and love the projects that will stretch me in my skills. I also want to thank you for this site as I’ve learned so much and you do such a wonderful job of explaining things and the visuals are so helpful. The pics in this new book are so wonderful as well – that’s what draws me to it as well!! Thanks!! Such a fan of Country Bumpkin! This book would be a fantastic addition to my embroidery “must have” list. I just added the digital Inspirations. What a joy this would be to share with my friends…. I read your review of this book and it sounds fantastic! Would love to win this giveaway, and wanted to say thank you for all your wealth of information you share on your blog. Country Bumpkin is just the best inspiration one could ever have. My Inspirations magazine are very much a used item. I am a very amateur quilter and would love to incorporate more embroidery into my work – plus I would really like to give some to our hopsital to give to needy mothers when they have children – this seems perfect way to do it all! I love that it opens up a whole new avenue for embroidery. I adore small blankets and throws in the den – there is nothing better for curling up. And the idea of having one that I embroidered would make for an excellent nap! Thanks so much for the offer! I have many Country Bumpkin books and love them all. In this book, I particularly love and want to make the little lamb. After reading about INSPIRATIONS in your column I ordered a back copy. Issue 29 arrived today and it is wonderful. The layout, writing style, photography, and directions are all superior. Projects have a different perspective than both the USA and British works (because they are up-side-down?) that make them feel fresh. I am so happy to have been introduced to this publisher. The old saw says “Don’t judge a book buy its cover.” I’m going to fly in the face of that and say that I fell in love with the cover of BLISSFUL BEGINNINGS and would buy it without a look inside. After reading INSPIRATIONS, I have confidence that other publications from Country Bumpkin will live up to the same standards. But, really, I love that frisky lamb and the animation captured in the embroidery of it and “Little Tommy Tucker, in his nightgown.” The simple beauty of the shaded blue flowers would be perfect embellishment for a creamy wool blanket I’ve been saving for just the right decoration. Please, PLEASE, PL…E…A…S….E pick me! I love this book. I love the pictures, the projects. It looks like the perfect book for me. I can picture completing the projects and giving them away . They are so darn pretty. Thank you for your wonderful emails and website. I look forward to reading them everyday. I am so excited to have the chance of owning this book as I would love to embroider a blanket using the directions and illustrations from this new book. The feel of using needle and all sorts of embroidery threads is very pleasing to me…a delightful tactful and visually pleasing experience. Country Bumpkin is the most unique and beautiful publishing group and I adore Inspirations magazine for years. The pictures of some of the pages in this new embroidery book that you posted on your web page makes my fingers itching to do a blanket for my grandson from this book. I am an art doll soft sculpture and wearable art bead artist and traveled to 4 areas of Australia to teach by invitation of several doll clubs in August 2004. It was during this teaching job that I was introduced to the exquisite art of hand embroidery. Some of my art doll students there taught me some stitches and I fell in love with this artful work. I am all alone here in South Florida with no Hand Embroidery guild to join so I am on my own. This book would be like working in a friendly guild setting for me. Hope I can win it but send best of luck to everyone who enters. I really want this book because I have a new grand daughter and would love to make some of this projects for her. I like have the patterns for the embroidery and even if I didn’t do blankets being a quilter I would probably do an embroidered quilt. I think Blissful Beginnings looks like a book I would love and cherish, and be able to pass on to my children and grandchildren. It looks like a beautiful book that would be lots of fun. I really hope I win this. Thanks for sharing. I just watched the video relating to this book…it’s all in the details Mary! Everything, and I mean everything is layed out there from beginning to end of each project. And the pictures, so soft and lovely. Oooo…I want to win this one really bad! Thanks for the chance. I love the lamb, the blue forget-me-not like flowers, the ribbon embroidered small roses–what else isn’t appealing about the sneak peek of this book. The photo instructions and detail of the projects makes this a great book to have as a “companion” to stitch with. Thanks for the chance to win a copy! First off I love the beauty of this book. I want to make baby blankets out of fleece for charity. I want to add embroidery to make them special. This is why I really want this book!!! I love the idea of making something beautiful and putting it away for “one day”. My husband and I are still in negotiations about babies and this would be a lovely addition to my bottom drawer :). I love it when babies are snuggled in hand-made blankies, like they’re enclosed in the love of the person who made it. I like the idea of embroidering blankets. I’ve been embroidering since I was around 7 or so (more years than I care to admit) and like to do new things to personalize what I make and give it my own touch. If I’m awarded this book, it will go into my library with “touchable books.” I have a rare neurological condition that has wreaked havoc on my hand strength and need for accuracy and precision. In spite of that, I so enjoy books with “touchable” pages and specific instructions. While my present skills prohibit me from creation of treasured needlework, I so enjoy the printed word and photo layouts that invite me in. The projects in “Blissful Beginnings” are precious and would make treasured heirlooms. I would love to be a winner and be able to curl up during the cold winter evenings creating something beautiful! Uh Oh! I’m in trouble now. I spent part of my allowance at our Casino here in Saratoga, NY today. How ridiculous to donate my money to the Feds. Obviously I didn’t win a dime. It would be special though to win this great book. I’ve read about it on Country Bumpkin’s site. We have one baby great-grandchild and this would be a perfect win because the instructions are always so thorough and the photography is splendid. Eye candy for sure. I love anything vintage and this says vintage in a big way! I love to embroider and have a 5 year old grand-daughter that I want to teach. She would love looking through this book with me! Wow! This is such a cool give away. I think that my favourite bit would be the assesories projects. I’m in love with the embroidered cubes. win this beautiful book. I REALLY want this book. I have been doing embroidery since I was 8 years old and have never made a blanket out of Anyang I have sewn so I would love to get this and be able to make a blanket for myself or for my kids. Also to be able to make a blanket when I become a grandmother. I have new babies in our family coming in the next few months and from what I saw on your site I would like to be able to do the little lamb. He is sooo cute! I like to make baby blankets that are great keepsakes (I still have both of my sons blankets). Thank you Mary (and Country Bumpkin)for this great give-a-away. I love the projects and I love to do embroidery while my husband is watching his sports. Thank you so much for the chance to win. Oh how i would love to win a copy of this book. Then I would be able to do a blanket for a very close friend who has been going through unbelievable amounts of stress lately. It would be lovely to see her smile again. The book looks so beautiful firstly because of the gorgeous projects, secondly because of the step by step instructions and thirdly because it’s from Country Bumpkin – you can’t go wrong! I love the projects in the book, and would love to have a copy under my Christmas tree this year. If I don’t win the contest …maybe Santa will bring me one. PS – Looking forward to your red work project. I am planing one for my Mom’s table for next years Thanksgiving / Christmas. The simple fact that “Blissful Beginnings” is a Country Bumpkin publication means to me that it is top notch and something to put on mywish list! Plus the fact that I have a new grand daughter and I would love to make her one of the blankets. The designs are so versatile, absolutely charming, and do-able, because the instructions are put together by people who really know what they’re doing. They’ve been there done that with every level of needleworker and proved themselves over and over. The photography makes this a book I can look through just to absorb it’s welcoming atmosphere. I would love to have this book so that I can use it for motifs for my crazy quilt. Also, my sister looooooooves sheep, and the Mary had a little lamb pattern would make a perfect for gift for her! I showed my mom the book (I’m 13), and she also loved it! It is a beautiful book that I would love to own! My original comment hasn’t shown up. Sorry if it doubles. What a lovely book just looking at the cover gives me “warm fuzzies”. The reason I would love to win this book is as I am a new Nanna I am always looking out for projects to make for my grandchildren and as I am expecting a new grandchild just after Christmas it would be a joy and pleasure to use one of the designs from “Blissful Beginnings”. as I am sure everyone else who saw this book hopes. Blessings to you. Hi Mary, I loved the preview of this beautiful book. I am going to be a grandmother for the first time in May 2013. An avid quilter & embroiderer, I was looking for some new ideas for a baby blanket. This book is so adorable! I would love to have a copy. well I adore what I have seen from thisbook thanks to you! I am a blanket person…collect em…but have never stitched my very own…I want to stitch some for my future grandchildren ..have started a crazy quilt for them as well…I have time as neither of my kids are attached yet…but ..umm..I am a planner! and of course worry I wont live long enuf to see grandbabies, but they will know me! ty for a chance very very much! I like how the book combines so many things—different embroidery stitches on to a blanket. I think the book would be a real joy to have. This is such a beautiful book!! I love to embroider, which is why I love your blog- and why I so covet this wonderful book!! This book appeals to me because I can picture myself creating the projects,& feel the fabric, needle and thread in my hands! The beautiful photos, organization and instructions draw me in and I am ready to create! I have 2 new babies in the family and would love to make some baby blankets. Thank you for a chance to win! I like the detailed embroidery stitches, especially the ribbon embroidery. I have always loved the embroidered blankets in Inspirations magazine. To have a book full of these lovely blankets is fabulous. What I love the most is the delicacy and sweetness of the designs. How can you resist that cute sheep? Like others, I love everything CB does and I am very proud that we have such a great resource right here in Australia. I reckon I should be lucky with this one, as today (24 November) is actually my birthday. Also I have never embroidered a blanket but would like to give it a go. Thanks Mary and CB for yet another wonderful opportunity. You have absolutely the best giveaways. I would love to have this book . . . my 11th grandchild is due in May 2013 and I would love to make a blanket like this for her/him. Over many years I have really enjoyed creating blankets for new babies-something different from the ones available in the shops!! In wool blanketing too rather than acrylics. As I am retiring next week after 46 years of nursing, I am so looking forward to devoting more time to my passion-embroidery. I have purchased blanket books from Country Bumpkin over the years and love the look of this new one so as always well done and keep up the great work so myself and many others can while away the hours enjoying our passion. I am your typical 60’s child. Mom drew a candy cane on muslin and taught me the back stitch…I never looked back! I love seeing my handwork on walks and bannister but love seeing it most in the nursery or tucked into a stroller. Looking at the projects you previewed, the “Love” blocks caught my eye. Charming and sweet for some chubby fingers to push around and chew on! Thank you for supporting the Inspirations group…they do so much to advance our passion for all things needle n thread. I really want this book as my great nieces and nephews are coming along thick and fast…. I am running out of ideas for blankets that I foolishly, happily promised myself to make for each new addition to our family.! This looks just what I need. I was an only child. I had 5 kids who had 14 grandchildren and 2 greatgrandchildren. I need baby projects and this would be wonderful. P. S. One child hasn’t married yet so I have the potential for adding to these numbers. I could make them all! What a beautiful book. It looks like it contains exquisite detail and instruction for each project from start to finish. It appears to be a book you could really enjoy and learn a lot from. I have quite a few of the Australian Smocking Magazines and have enjoyed making a number of the beautiful dresses from them. My granddaughters picture is in issue 85. I have really enjoyed being a part of Country Bumpkin. Thank you. I really appreciate the detailed instructions and the variety of designs. When starting a new type of project I am always hesitant or apprehensive, but these directions seem so clear and detailed that that shouldn’t be a problem. The designs are universal and classic making this book a treasure. SWEET, SWEET, SWEET, SWEET, SWEET! Oh, the little lambie…so sweet. I love the idea of embroidering on blankets. It is a way of saying, “You are here, in the world…and I noticed. You are special…just as special as if you were God’s only little lambie in the world.” Love it. Beautiful book! I love to make dovets with embroidery and is almost finisht with my last one. My grandchild is now 1 year and 2 months and I am planning to start a Dovet for her but have know idees for hetR Images. this book will help me a 100% for baby like Idees. please think of me when you choose the winners. thanks. I do alot of embroidery work and am always looking for tips and techniques that help me make my work better. Also, always looking for inspiration for new projects. This book looks like I would cover all those needs! I’ve never embroidered a blanket before but would like to after reading your book review. The projects are beautiful! This is a beautiful book, I love the pictures, I want to make them all. Baby blankets are what I give my friends when they have babies and these are just lovely. The projects in this book are sooooo cute!!! I love the paisley blanket and the blocks. Also, I already make blankets and having a book that gives detailed instructions on the construction of one would be awesome and helpful. And on the Thanksgiving weekend – thank you for a wonderful give away and your blog/website. My love of needlework and all things done well makes me want to definitely own this book. I have always purchased Inspirations since I discovered the magazine and hope the ‘ print ‘ version does not go out of print, even though it costs me twe4nty three dollars a copy by the time I get one copy, and that is from a Canadian dealer and I am Canadian. Their books and magazines are so well written and have a wealth of talent in them. Mary, you should truly be a part of this magazine or have one of your own. I have purchased your ebooks and they are just as magnificent. My favourite being the church embroderies. Hi – What a beautiful book! I love to try new stitches and new patterns. This is just gorgeous. I’m expecting my first grandchild next year and it would be a pleasure to make some of these items for him/her. I’m a quilter but I’ve never made an embroidered blanket before. I have one that my mother made for me many many years ago. (small infant blanket). I have a new granddaughter and this would be something special that I could create for her. It would be her keepsake to pass down to future generations. Hi Mary, This book looks lovely and I would like to try some of these designs as my husband and I are awaiting the arrival of two grandbabies one in March and another in April. Could comment on all the above. Country Bumpkin publications are beautiful and usable. Clear instructions and gorgeous photography. I have most of their Inspirations magazines and needlework books. Never disappointed. Both of my grandmothers taught me to embroidery and I would love a book to continue learning new methods of embroidery. I have one grandson and expect a few more in the future and it would be great to start another blanket. Thank you for all your inspiration. I would really like your book, because I reeeeally want to know how to make that beautiful blue, red & green design on the bottom left hand side of the front cover…. and I won’t know without getting my paws on that book!! Blankets are wondrous things. They can mean so much to each person for so many diverse reasons. At our house, any handmade blanket is called a “blanket of love”. I have seen them work miracles as they comfort little ones in cancer treatment through the Linus Preject. The old ones appreciate the fine work and time invested in something made just for them to wrap themselves in warmth and comfort. our teens and “twirty” something children can wrap themselves in our love when they are far from home or just feeling the distance between us as they grow into their own lives. As you can see, blankets are treasures in our home. The book would enable me to make more ” blankets of love” to spread the joy further. It would also help to inspire my thread worthy friends to join me in my quest. What a fabulous book! The appeal of this book certainly comes through – there’s a nostalgic feel combined with modern instructions. Reminds me of seeing all the baby blankets made by grandmas and moms and first wanting to be able to do the same thing. Embroidery is my “therapy” – mistakes are almost always correctable and it does not bring out the fear sewing/quilting always does. i REALLY want this book because it would help me make wonderful memories for my own grandkids! Thank you so much for offering this review and give-away! The book looks WONDERFUL! I think the part about the book that appeals to me the most is that there are so many projects that would be ideal gifts. Since many of my nieces and nephews have been getting married recently, I’ve been making a lot of gifts! Before too long, I’ll probably want to make some baby gifts, and there are some great ideas for them in this book! Thanks for such a detailed review of this book and the giveaway chance. Based on your review, what really appeals to me about Blissful Beginnings is that it looks like a “complete” book, not just an “idea” book. I like inspiration, but I really like adding books to my collection that include the soup to nuts techniques and instructions of the projects. Oh my, where to begin. It has to be the designs. They are so lovely and unlike any other I’ve seen. Baby blankets are so often cute and predictable. Nothing at all wrong with that, but these take the blankets to a new place–lovely and artistic yet completely appropriate for decorating a baby’s blanket. Then I could go on about the directions, they look simple and clear, but no need to do that since I just can’t quit thinking about those designs!!!! Thanks for introducing us to the book Mary! I want this book because I know the quality of all the Country Bumpkin instructions and illustrations. Although I may never actually make a blanket, I’m sure the ideas can be put to use in other projects. After reading your review who wouldn’t want it! I’m desperate to to able to stitch the beautiful projects I see but havaen’t got the confidence to get started. Through this wonderful book not only am I inspired by the wonderful projects but it’s almost as if someone is holding my hand and guiding me through the projects one step at a time and helping me fulfill a dream of a lifetime. I am pregnant and love to embroider. This book has wonderful and very unique projects. Perfect for what I would like to make for my little one. I knew as soon as saw the picture of the lamb in your review that “I really wanted this book”. Beautiful give away. Just looking at the few posted pictures in Mary’s review, I started to reminisce. I always love things from the past and these blankets take you there for sure. They are happy, friendly pictures. I would love to have this book. After reading your review and sampling the contents I have to ask you, “What is NOT to like about this book” The step by step instructions, the project ideas and the known quality of their previous books makes this one a “must have”. Thans for the opportunity to win a copy. The Cover Picture is enough for me to want this book. Your description shows very detailed instructions which is always nice to have. Thank you for the chance to get this book from you. 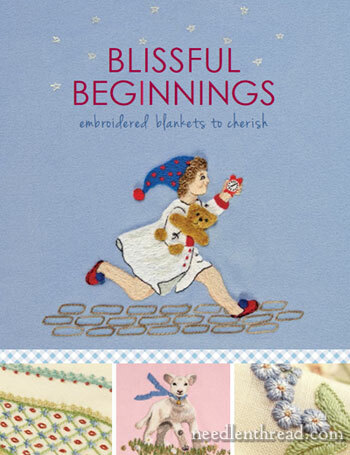 There are multiple reasons why Country Bumpkin’s new blanket book Blissful Beginnings appeals to me. The project instructions, diagrams, stitch charts and illustrations appear easy to follow. Then there’s the nice assortment of themes to choose from ; Mary had a little lamb, adorable Wee Willy Winke running through town with his teddy bear and the soft fabric blocks to name a few. I can imagine adapting these projects in colors to match a nursery or the choice of a new mom or re-creating a replica of the original designs. My oldest daughter recently married and although children are not planned for a few more years, I know working on these projects would satisfy the “grandmother craving” I have. By completing some of the blankets, the blocks and perhaps a few ‘onesies’ with the Blissful Beginnings characters embroidered on them I will be ‘pre-prepared’ for the big event! I’ve followed Inspirations magazines for years and I am confident that their books will be top-notch. Well I just really want this book. lol The photos of the ribbon roses, I would love to see the rest of that project. And that lamb. soooo very cute. Hand embroidery is my first love, and what I learned to do a long time ago. I have a grandson due to arrive in March. What a beautiful, unique gift a blanket made by Grammy would be! I’ve embroidered many things but not a blanket. Absolute eye candy, but without the calories. Would love to win this beautiful book. This book would be helpful by providing me with new ideas for embroidered blankets to be raffled at my friend’s annual charity. She is a business owner here in Tucson and holds a raffle of donated hand-crafted items every Christmas season. She gives all the monies to various local charities. I just found out that I have a 4th great grandchild on the way. I’m tired of doing quilts or afghans, but these blankets are just precious! I really want to win the book so I can pick one out to start working on it. I love the idea of embroidered and can’t resist the draw to make one for my self. The embroideries are very beautiful. Thanks for the opportunity! Why do I want this book? Well, to start, I have 2 shelves of stitching books, and I need it for my collection! I love looking through books for inspiration and ideas, and this book look fabulous. It would be a treat to have it as part of my collection and to use for future projects! Pick me! Pick me! Pick me! Me and my embroidering hands are ready to move on to making blankets. I have made quite a few kitchen towels and aprons and gifted these to friends and family. I think I’m ready to graduate from these “mini” projects and now am ready to make something different. Blankets, yes! This book is an embroiderers dream. So many blankets that can be made for those beloved children and grandchildren and the fact that it is not out yet makes it all the more interesting. I’m sure I will make at least two of the projects for my grandchildren as they love to cuddle up with them while I am reading to them. I would really love to have this book. It’s not only the beauty of the book that says “I want it” but the clear instructions on finishing the blanket. I am just about finished my first blanket and I will most certainly use the instructions if I am fortunate enough to win a copy of the book. I have had great pleasure and a real sense of peace and joy while embroidering my blanket. It has taken a while as I jumped in and did a large blanket. I have done other types of embroidery with much enjoyment but there is something very special about embroidering a blanket. I’d really like a copy of this book because the project instructions represent something that I can hand make for my own future son or daughter. Something that I can create and possibly become a future family heirloom! I love the idea of embroidering blankets. I make a lot of baby quilts and this is another way to wrap a baby in warmth and love. I love Embroidery and i do love blankets! So the simple idea i could Embroidery blankets makes me happy! Oh why would I like this book? I have done three other blankets over the years from Country Bumpkin and loved each and every one. I am sure I will love these just as well. With grandchildren arriving in a steady clip there is always reason for a new one. I THINK my favorite will be Little Jack Horner from the sneak peek, but who knows, there may be another treasure in there I haven’t seen yet. A book which describes the joy of creating and giving a handcrafted blanket is so far removed from my time of recycling old Army Blankets for use by my family. Blankets comfort,nurture and protect the user… isn’t this the ultimate gift for a person you care about. I am in Christchurch New Zealand, we were devestated by multiple earthquakes 2 years ago and now the gifts I give which are hand made are so much more meaningful in what has become an “unstable & uncertain” environment. I would cherish this book as a resource to continue my handmade gifts to family, friends and colleagues. When I read your review of the book, then saw the photos, I realized that I MUST have this book! The detail on instructions, the stitch guide, all of it, is a must have! It seems to answer every conceivable question! I am thinking this book has many, many uses, and the possibilities for projects, endless. Whomever wins this book will be sooo lucky. I just met Susan O’Connor and Fiona Fagan when Susan taught in Beacon NY. What fun! Susan’s work is exquisite and I am sure that this new CB publication is as exceptional as all of the others. What an adorable book–my heart is dancing with anticipation to begin a project. Any of the designs would insure a blissful sleep for a little one! I love Country Bumpkin books and magazines. The instructions and pictures are easy to follow, and I have learned new skills in embroidery using them. The book looks gorgeous!! The ideas look wonderful!! I would love to make some for gifts!!! I found your blog some months ago while searching on how to learn embroidery. I’ve just started. I have to say all your tutorials, step by steps projects, and book reviews have been very helpful to me! Thank you for doing such an amazing giveaway! I would love to have this book because as always , Country Bumpkins publications are a treat for the soul , and this book is not an exception. I would like to win this book because of the projects. I will have a new grandchild this spring, and this book will lead the way to blankets for the blessed event. I love working with wool whether it is the ground fabric or the thread or better yet both! Nothing needles as nicely as wool and the colors are so soft and lovely. That is why I would love to win this book. It is winter here and sitting on the couch stitching a wool blanket would be so cozy! When I first saw the promo for this book from Country Bumpkin, I knew it was one I would want to add to my library. Their publications are always of excellent quality, and having made one of their “Beautiful” blankets for my niece, Hannah, I can say they make up perfectly and make a gift worthy of hierloom status, if so desired. Making a handmade blanket can be such a rewarding project. I plan to make several once I retire, and this book will inspire me, I am certain. I’ve been wanting to find a pattern/book for constructing and embroidering blankets. When I saw this post I was so excited. This is exactly what I was looking for. Blissful Beginnings looks like a really wonderful book that has it all. I have already embroidered four baby blankets in the past and had searched for appropriate designs to embroider on them. I have just been blessed with a grandson and the thought of making a baby blanket to wrap the little bundle of joy is exciting and I am itching to get on with it. This book seems to have a lot of ideas, stitches, designs, et all that I am all excited. Thank you, Mary, for the generous offer of this give-away. I love the projects in this book. Your recent review was fantastic and had me dreaming of the possibilities. I have two grandchildren due in February and would love to make them a blanket or use the embroidery patterns for something special from Nanna. What I really like are the beautiful pictures. They really inspire me and broaden the horizon of possible works to undertake and enjoy. Thanks so much for this giveaway! This is definitely a must have. I have acquired an unexpected step-grandaughter. She is no longer a true “tyke” but has missed out on many of the childhood things. I would just love to make something warm and pretty for her birthday in January. It has such delightful ideas that even a 7year old would love. I also could have the fun of teaching her to finish the embroidery as the instructions for stitches are so clear. It might one day become and heirloom. What appeals to me most about Blissful Beginnings is everything! their marvelous projects, the clear instructions, nice, large pictures so you can really see what to do, and the step bystep finishing up. really, you can’t go wrong with their books! And besides I love embroidering blankets for babies and am always glad to new inspirations. even those that aren’t especially for babies can be used. LOVE the simple designs, lovely flow, great colors. I fell in love with the little lamb, and would love to make a lap blanket with little lambs and flowers along the border. Thanks for the chance to win this beautiful book! I love the antique look of the projects in this book.. My Grandkids would love a blanket with the beautiful embroidered patterns in this book. As with other Country Bumpkin publications, this one “has it all”. Great projects that can be completed as shown or used in other projects of your choosing, detailed and complete instructions and wonderful pictures to help us along. I would love to own this book. Thanks Mary! I love the patterns in this book. What really appeals to me is the little lambs. I would love to do some embroidery of them! Winter is cold up in the Canadian capital, where it can reach minus 40 degrees + then add a wind chill! About the only thing that makes a chilly day bearable is the thought of snuggling up under a cosy blanket with a good book or a wonderful movie on TV. I think that my seven year old daughter, who has been embroidering since she was three may very well love to help her Mummah create a gorgeous blanket to cover up in this winter…. hope I win the book! I gave birth to my first baby girl in August,shortly after I picked up embroidery and ever since I have been trying to think of something to make for her. This book would be the greatest gift to me to give her a wonderful gift! The step-by-step guides are essential for me as a beginner, and I would enjoy so much to be able to make something special for her to keep forever! What a wonderful book! I have ALWAYS wanted to make a blanket, but have put it off because I felt I needed a little guidance, something to refer to as I went along. (Maybe I’m better at it than I think, I don’t know) And the idea of pictures to give me an idea on what I want to do. After recent major back surgery, I’ll have a lot of time on my hands and will need something to keep me busy. Keeping my fingers crossed! Thanks for your wonderful blog… I am excited about your great giveaway… The ideas and illustrations in this book are gorgeous and I can think of so many ways to incorporate this into my work! Thanks! Ruth L.
Firt of all, I love everything Country Bumpkin puts out!! Their pictures are fabulous and the books are all just beautifly done. What attracted me to this book is the blankets with the qute embroidery. I have recently started embroidering again and enjoy doing things for my new grandbaby. Blanks are always needed and what better way to make them but to add that special embroidery touch. Cute, practical, and an heirloom. Thank book would be a GREAT go to book for so many things. I would just love this book for some great ideas in making blankets for the new grandchildren. So many ideas that actually I think it will be hard to decide which to use. Oh, man. Can I say, all the above? Thank you, Mary, for your hard work and arranging so many quality giveaways! I’ve made three beautiful blankets from the Beautiful Blankets book and would love the opportunity to make another for our first great grandchild. I love working on blankets, especially during the winter months as the blanketing keeps me lovely and warm as I stitch. It would be wonderful to leave something for our great grandchild to remember me by as I always embroider my name and the date I stitched it on the back. Keep up the good work with your wonderful articles. I’ve learnt so much already from your “how to stitches” section to the piece about how to copy the pattern onto the chosen material. I love the embroidered blankets. I am in the middle of the Berry Harvest blanket from Inspirations 49. I have two nieces due at the end of this year. Over Thanksgiving, I found out another niece is due in May. I would love the new book with some fresh ideas. This book lookswonderful- like it has all the answers I need to makebeautiful, heirloom-quality gifts. I’m new to embroidery and love ideas this book inspires. What a treasure it would be to win such a gift! The thing I love most about this book is that the projects are 100% practical! So often, I want to embroider a lovely project and then afterwards it just sits in a drawer, waiting to be framed to hang on the wall space I don’t have. This is a perfect use for lovely stitching! I REALLY, REALLY want this book because I know that I might actually be able to complete one of the projects included in this fabulous book. Every publication from Country Bumpkin is so well produced, brilliantly thought out, and so clearly presented. The previews, and your review, make me want a copy to plan out projects for my grandkids. What a wonderful addition Blissful Beginnings: Embroidered Blankets to Cherish would be to the small library I have. My mother taught me to embroider when I was young and I have always loved everything about the craft. After reading your thorough review, Mary, I was just enchanted with the book. What appeals to me the most is the beauty of the work showcased….such inspiration. It would be such a thrill to win this book. Your review of these blankets caused me to subscribe to Inspirations—-thank you ! I love the detailed embroidery, photos and inspiring ideas! I would love to add this my stitching library. Je suis grand-mère de Sophie née en septembre dernier. Grand-père n`a pas eu le bonheur de connaître sa petite-fille car il est décédé en août. J’aimerais beaucoup combler ma solitude en brodant une couverture pour ma petite-fille qui habite Lisbonne. Merci Mary pour tant de gentillesse. I am awaiting my first grandchild and would love to have this book. I know from other Country Bumpkin books that I can follow the directions and be successful, although I am not a seamstress. I am so excited and can hardly await our new addition! Wouldn’t a blanket just be a wonderful thing? What a lovely idea. I have some “vintage” formerly white wool that is sooooooo soft, also a rose colored piece. I have been saving them for just the right kind of needlework to make them into baby/children’s blankets. When I saw this article I knew this book is what I have been waiting for. As the chances of me getting another grandchild are slim to zip and I love to make baby quilts and blankets I donate the majority to children in my community that are in need of something to cuddle. I love how this book explains in detail how to do everything. Creating something like these projects are what my family cherishes the most. Thank you. Some very nice project ideas in this book. Also, the stitch diagram instructions look pretty good to me, at least in the images of pages that you provided, Mary. Thanks for counting me in. i really like step by step instructions, and colors, lots of colours! I really would like this book because it’s a book on embroidery, and they are my favourite. Blankets, I love doing them, although my grand-daughters are now too old and too far away to do one for them. But, my sisters are having grand children at the rate of one or two a year. A blanket would make a lovely present. with this book, dreams become reality ! Admire photos like the little lamb ! The books, that you recommend by Country Bumpkin, are the most beautiful books for embroiderers. I discover many beautiful books in your newletters : I wait of your newsletters impatiently ! a very big THANKS ! I feel that my heart strings have been tugged from the first sight of this book. It embraces the essence of what I would like to produce. Beautiful things that are not only functional but keep your heart warm too! Mary, I would just love to have a beautiful book of blankets. I can just imagine my little Grandchildren cuddling up in one of these blankets made with love by Grandma Sharon. I love surface embroidery most of all and would feel so very lucky if I were to win one of these. I have never stitched any blanket. And I am not sure if I’ll stitch some one day. But I like the projects, that could be used in many different ways. And, of course, the beauty of this book is one of the reasons, why I want this book so much. Country Bumpkin’s books are wonderful! This book full of designs for baby blankets would be just a great addition to a library of other lovely designs. The designs are not only clever, but the pictures of them are so clear and detailed. I love the idea of making special keepsake blankets. My mom’s generation is the first in our family to NOT make quilts, but I’m trying to start back up the family tradition (I just made my first one-it’s part of my 3 year old son’s Christmas present!!). Anyway, I also do embroidery, and I love the idea of using embroidery to sort of put my own signature on the blankets I make. We still have lots of quilts that my grandmas and great-grandmas stitched. I’d love to put in the time to make some blankets people want to hand down from one generation to another! What appeals to me most about Blissful Beginnings? Everything in your checklist- tThe projects, the instructions for embroidery or constructing blankets, and aa beautifully crafted book. I’d love to own something as unique as this, peruse through its pages and make a baby blanket for the one I hope to have soon. I would be blissfully happy to own such a book as I am about to become a Grandma for the first time and would love to make one of the blankets for my new grand baby! The patterns are adorable and I can see one blissfully happy baby wrapped up in one!